Sarah Beasley was my point of contact for the most part (wedding at OMH) - she was absolutely wonderful in every way possible. She actually showed me the apartments above the venue during our venue tour and I was immediately sold. Booked it as soon as I secured the venue! The property was extremely convenient to the OMH (our wedding venue), which was perfect for getting ready/waiting for the ceremony to begin. Beautifully furnished, very clean, easy parking. It was great to be able to have my photographer come up and shoot our pre-wedding photos, our officiant up to speak with us pre-ceremony, and how convenient was it to retire there post-wedding!? Our only concern was the noise level both inside and outside of the property. The pedestrian mall was loud. The second night we found the sound machine in the bedroom which helped tremendously! Slept like babies with the fan noise! Great location. The Belmont restaurants and bars are only .3 miles away. Not really walkable to the downtown mall. Your staff was amazing and attentive. Ana was amazingly helpful in booking and was just super sweet. Joe our driver was overly accommodating and even helped us out in the morning when the cabin lost power. The staff responded immediately with two phone calls and helped us find a good breakfast place since we couldn't cook without electricity. I would highly recommend all of your services to anyone visiting Charlottesville area. Would love to know if you manage any other destinations for travel! WE thoroughly enjoyed the property's view, amenities, and style of the cabin. We loved the upgraded cooking tools and serving glasses/pieces/dishes. We stayed in to cook every night. Friendly neighborhood. Easy walk to Scott Stadium or Fry's Spring area. 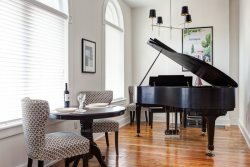 The house is centrally located in Charlottesville, so anything in the city is a short drive or Uber ride away. It was amazing! The views are great and the house is great! The photos just don't do justice to this place. The views are incredible. The property is huge, and offers so many nooks and crannies to discover. We visited with our children, and it was a magical experience for all of us. The house was lovely, and very comfortable, but we all spent most of our time outside, walking the property or relaxing on the porch reading or playing games. Bring a camera if you come, because the photo opportunities are endless. Everyone was incredibly helpful and very friendly. The location was awesome and made coordinating all of our wedding activities very convenient! Your team responded to inquiries and requests promptly. We enjoyed our stay in Kempton Place. The setting (mountains), morning walks / jogs, and beautifully designed farmhouse were perfect for our large family weekend. We were a few minutes from Pippin Hill and only 15 minutes to Charlottesville center. Great bedrooms and private spaces and plenty of space for a big family! The team members I worked with were fantastic. After initially booking this property, we were notified that the owners were no longer going to rent it. I reached back out to the team to see if the owners would be willing to make an exception for us, and the team member very promptly asked on my behalf and got back to me with a response (lucky for us, a good news response). Thank you!! We could not have better enjoyed our stay. The cabin was very comfortable, clean, and pleasant, and the surroundings were simply delightful. It was quiet, relaxing, and restorative. We loved walking down to the pond, lounging by the pool, swimming, and playing with the dogs. We hope to stay here again in the future! Kate was wonderful. She answered my questions and was always very pleasant and responsive! Having the bedrooms, each with its own bathroom and a half bath was wonderful for our needs. The extra bonus was the downstairs area which was separate and had a futon, another bedroom and small sitting area. Everyone was comfortable. The master bedroom was spacious and beautiful and we were able to have photos of the bribe, dress and bridesmaids taken in that room. The bedrooms are located away from the kitchen area allowed others to sleep while the night owls hung out in the kitchen. The sound did not seem to carry. I have been so pleased with Stay Charlottesville and will continue to use you whenever we can! We were quite pleased with the Jefferson Park house and are looking forward to staying there again. It is located close to the University and has been recently renovated with nice bathrooms, a great kitchen and new furnishings. Our family of five had more than enough space and found the house met all of our needs. We were pleased to find another great rental with Stay Charlottesville! Dog friendly, with great views. Also, enjoyed the fireplace! Staff at Vineyard was also great!